The Obama Admin Was Spying on Roger Stone, Carter Page, Paul Manafort and others... President Trump Needs to Release ALL of the Evidence! The Obama Admin Was Spying on Roger Stone, Carter Page, Paul Manafort and others… President Trump Needs to Release ALL of the Evidence! President Trump said he will declassify the FISA court material following the conclusion of Mueller witch hunt. The president decided to wait until the end of the Mueller investigation to release the unredacted documents to the American people. The Deep State and Democrats are horrified that the American people will finally see the corruption and lies of intel officials in order to spy on Trump and destroy his campaign based on known lies. President Trump needs to order the release of ALL OF THE DOCUMENTS. Who was spied on? Who approved the spying? Did President Obama approve of this deceitful practice? 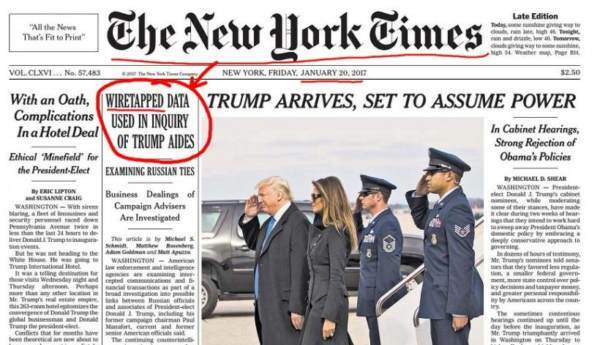 The New York Times reported in January 2017 before the Trump Inauguration that Roger Stone, Carter Page and Paul Manafort were being spied on! …Mr. Manafort is among at least three Trump campaign advisers whose possible links to Russia are under scrutiny. Two others are Carter Page, a businessman and former foreign policy adviser to the campaign, and Roger Stone, a longtime Republican operative. The Government has never acknowledged this. It is time to out these deceitful and dangerous deep state operatives. Their attempted coup d’etat failed. If jail time is needed it is time to throw them in jail.